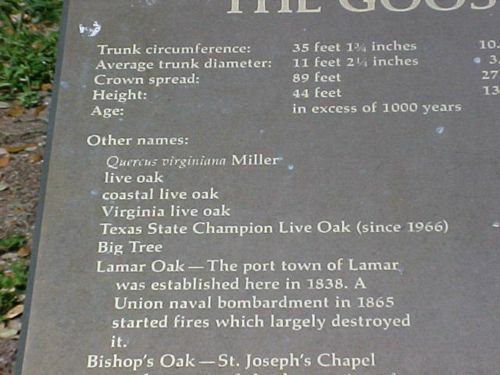 The Goose Island Oak, aka The Big Tree, aka The Bishop's Tree, aka The Lamar Oak. Record or Champion Trees are determined by their girth, their spread and their height. 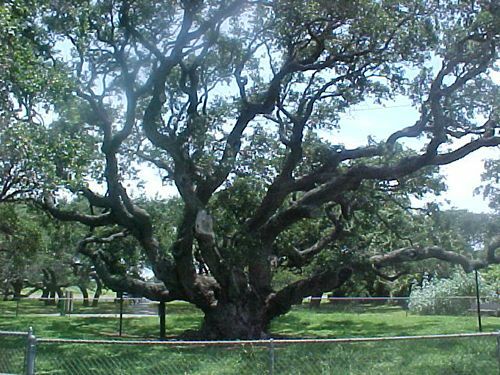 There are many Live Oaks that surpass this tree's height, however when the tree's girth is factored in, it makes this one the Champion Live Oak in Texas. 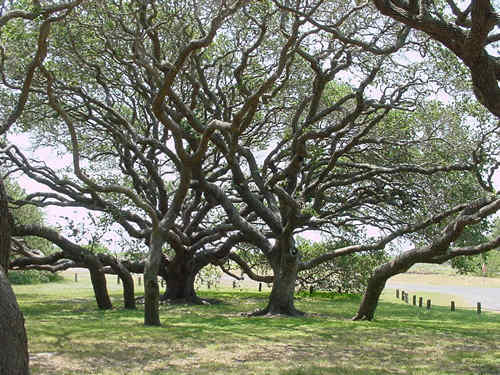 Texas' largest tree is found on the Lamar Peninsula within the Goose Island State Park just off highway 35 before you reach the Copano Causeway (if you’re coming from the north). Signage will direct you, but the signs are close to the ground and infrequent. The tree has allegedly been a hanging tree, a pirate's rendezvous, and even a ceremonial site for the cannibalistic Karankawa Indians. 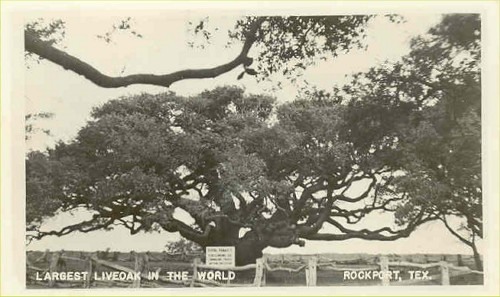 "Largest Liveoak of the World, Rockport, Texas." 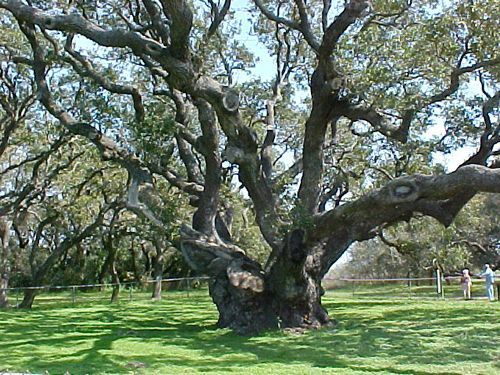 The tree has disappointed generations of Texans who often feel that their Live Oak back home is bigger – or at least taller. They may be right. Determining a record tree involves three measurements: the spread of the crown, the circumference and the height. An overall score is reached by these factors, and according to the experts – this one is the winner. 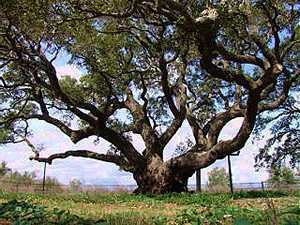 In the case of the Goose Island Oak, the factor least argued about is the tree’s massive girth. 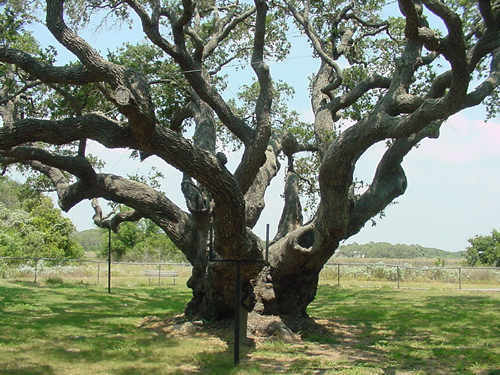 According to the book Famous Trees of Texas, the tree’s circumference was recorded at 42 3/4 feet in 1966. The crown was 44 feet high and the spread was 89 feet. The tree is naturally linked to anyone remotely connected to the coast – from a meeting place of the rude Karankawas to Cabeza de Vaca and LaSalle. 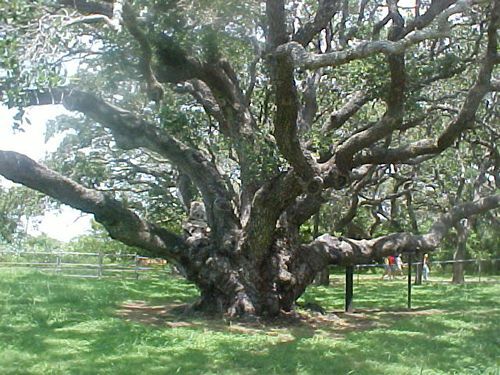 The estimated age of the tree is 1,000 years old. Although a core sample has not been taken, it shouldn’t be too long until technology allows for a reliable determination of the tree’s age. While the tree has had its immediate neighbor’s thinned-out over the years, enough of the trees younger cousins have survived to give an idea of how the mott appeared in the past. The unusual branching pattern is a result of the near-continuous gulf breeze. Estimated to be 1,000 years old, the tree can disappoint visitors who had been imagining a Giant Sequoia. Our tip for visitors who don't want to be disappointed: Don't visualize Giant Sequoias. The Goose Island State Park allows an opportunity for observing the migratory whooping cranes and deer abound in the thickets. While visiting the tree, you might consider visiting the picturesque Lamar Cemetery - shown on detailed TxDoT maps. Lamar was a town named after the Republic of Texas' second President that held great promise in the 1830s. Lamar is included in More Ghost Towns of Texas by T. Lindsey Baker, University of Oklahoma Press, 2003. 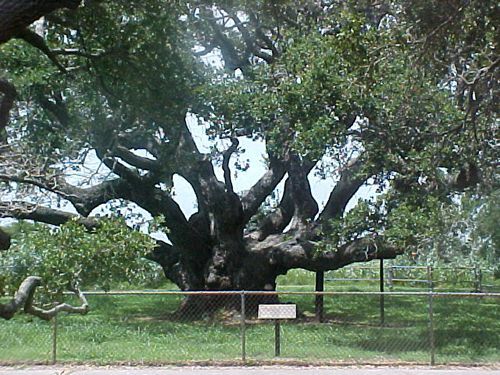 Texas' second largest Live Oak is in Columbus, Texas. 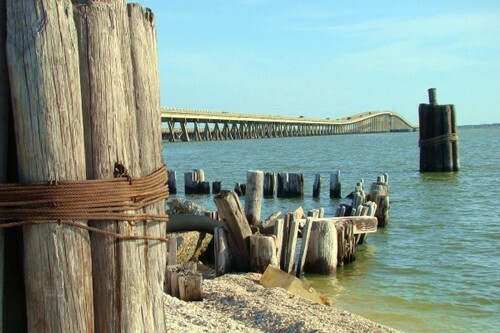 Leaving Fulton, heading N and crossing over the Copano Bay bridge, the first right will be Park Road 13. This will connect with Lamar Beach Road that can take you to the tree. Signage is adequate for finding your way there after leaving Highway 35, and depending on the time of day or the season, you may encounter deer on the narrow, densely shaded and flowered road.